Genus of plants of the family Ericaceae. It grows in wet mountain forests, at an altitude of 2500-3000 meters above sea level. Distinguish between evergreen and deciduous plants. Deciduous species are called, azaleas, rhododendrons called evergreen. Blooms in winter and early spring (January to April), with three - four years. In 1808, Captain Velbenk brought from India blooming azaleas in Kew Botanical Gardens near Londona.S since rhododendrons in the culture of gardening and breeding work with them continues. 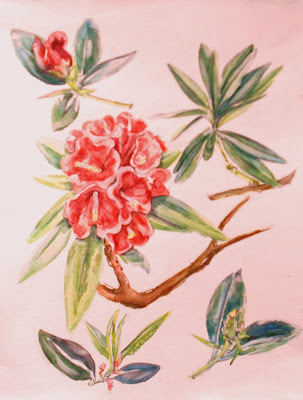 At home, rhododendron grown under high humidity (70-80%) at a temperature of not less than 18 ° C.